So some of you probably know from our Facebook page that I have finally gone and registered to run the Baystate Marathon again this year. After experiencing some nagging pains which led to a visit with the physical therapist and a few test runs, I decided to go for it. 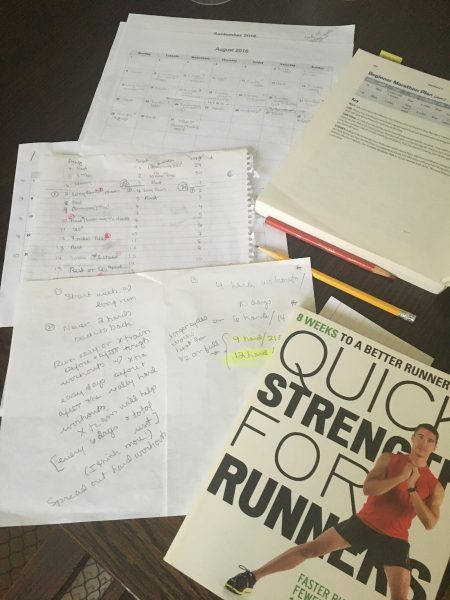 Still, I wasn’t sure that I was 100% and I had some reservations about diving back into what would be my 6th week of the intermediate plan from Runner’s World, Big Blue Book of Marathon and Half-Marathon Training – which has served me well in the past. Since my Baystate goal is also tied to my plan to raise money for Homes For Our Troops by donating based on my miles (please donate if you can! ), I was worried that going into this training cycle like nothing was different might completely side-line me with an injury – and prevent both my running Baystate, and raising money for this great cause. So I’ve made a big change. After lots of reading and research, I decided to go to a 28 day plan. This plan incorporates 12 hard workouts from what would have been the next 28 days of my old plan, but it allows me to incorporate the cross training I was doing with Quick Strength for Runners, by Jeff Horowitz, and to keep to the criteria Horowitz suggests with these workouts. It wasn’t easy trying make all the pieces fit and then setting them down on the calendar, but I did the best I could (I suppose it’s an experiment, anyway, with me as the guinea pig!). Though the cross training workouts don’t add a lot of miles to the weekly totals, they are enjoyable and far more challenging than the cross training I had done in the past and I can already tell I am reaping benefits from them. Plus it’s fun to work with the BOSU and the stability ball! With this longer plan, these two weekly workouts don’t get squeezed in before or after the really hard running workouts, which leaves me stronger and more rested to do my best for each one. For example, I felt really good going into this week’s 15 miler, and didn’t feel wiped out afterwards. Of course, I know that for most people there are difficulties following any plan that doesn’t align with a Monday through Friday workweek. I’m lucky to have a flexible work schedule right now, and even more importantly, the fact that its summer, and we have all these hours of daylight will help. With my 28-day plan and my new cross-training regimen, I feel pretty good that I’ll get to Baystate in good shape in October (plus Nora is joining me, so it will be even more fun! ), and I can continue my “Run for a Reason” project with Homes for Our Troops. If you’ve never done this, consider logging your miles for your favorite charity – or visit my team at the Homes for Our Troops, Team name: Marie@ 2 Generations Running. It’s a great cause with a great rating from Charity Navigator. And I’ll keep everyone posted about my progress (or not…) with my new 28 day plan! This entry was posted in Training and tagged 2 Generations Running, 28 Day Plan, Baystate Marathon, Homes for Our Troops, Marathon Training. Bookmark the permalink. That sounds like a good shout! I’m currently training with the Run Less, Run Faster (also known as the FIRST approach) programme, and it sounds quite similar. Essentially you have three runs a week but each serves a specific purpose- they’re essentially a tempo run, interval repeats, and the long run. The paces are faster than other marathon plans, but since you have a lot more rest time, you’re expected to be able to hit those paces. And then you have to do two cross-training sessions a week- cycling, swimming, rowing, or aqua-jogging – as well as strength and stretching. Good luck!